Thank you to everyone who came out to see my shows over the last five years! It has been wonderful to play music for all of your families and to see your children grow up. I will miss it! 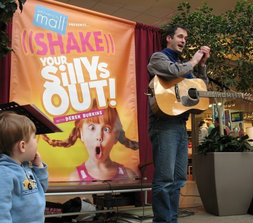 "Some parents might tire of hearing "Old MacDonald Had a Farm" on the car stereo for the 50th time, but the song never gets old for musician Derek Burkins..."
Read the whole story in KidsVT!